Another surprise announcement not that long time ago is really one of my favourites. You must admit that tank with two turrets is really cool…(of course unless you are sitting in it and trying to fight off Panzer IV). I personally like the box-art Hobby Boss has used for this kit. Surface details are nice and molding, though not at a level of Dragon yet, is very fine too. I notice some delicate parts (handles) which were really nicely molded. The parts count is not that high, so the build could be quite a quick one. There are two photoetch sheets offered, so you might also avoid needing aftermarket sets. But overall, I am happy that this kit came to see light. I like the colour marking plates that Hobby Boss provides. the markings are offered for two Russian vehicles – one with machine guns in both turrets and one with one cannon and one machine gun. “The T-26 tank was a Soviet light infantry tank used during many conflicts of the 1930s as well as during World War II. It was a development of the British Vickers 6-Ton tank and is widely considered one of the most successful tank designs of the 1930s. It was produced in greater numbers than any other tank of the period, with more than 11,000 produced. 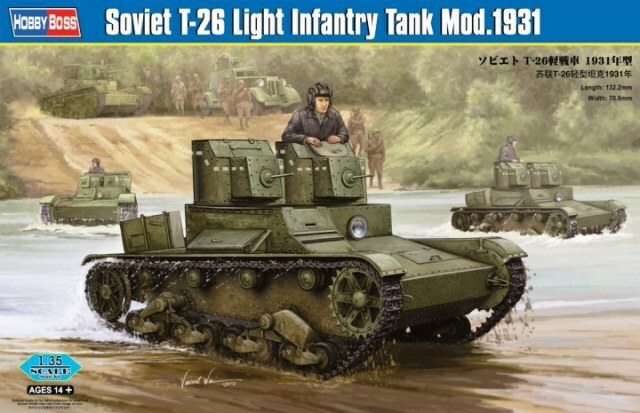 During the 1930s, the USSR developed approximately 53 variants of the T-26, including other combat vehicles based on its chassis. Twenty-three of these were mass-produced. You can find more information about this kit on the website of Hobby Boss here.